In the beginning of the century the the new country was afire with the quest of building. Not just architectural building but nation identity building. The concept of development was significant. Industry and knowledge became important concerns. In the early 1800’s education became a center of attention. The citizenry believed education would prepare its children to become good citizens and leaders. Music and art were respected. The press became more important as more people learned to read and sought intellectual improvement. Many new inventions such as the cotton gin and the stone crusher, as well as improved methods of manufacturing helped develop industrial cities. Businesses grew and more banks opened. Many agencies were developed to provide services to the cities. People’s rights and needs were being recognized and protected. In New York State the Erie Canal was completed in 1825. The War of 1812 furthered animosity towards England and in the 1820's public sentiment turned to the Greeks as they fought a war for independence. Discoveries of Grecian ruins moved the architectural culture from the Federalist (Roman inspired) style to an appreciation and respect for the beauty and perfection of ancient Greek culture. Greek Revival style architecture reflected intellect, prosperity and stability and became an expression of a nation that sought advancement and greatness. It was popularized as an expression of the democratic principle of equality and was the first wave in the Romantic residential architectural styles. Romanticism as a movement in the arts is nostalgic in nature and embraces things of the past and places far away. Romanticism continued until the very late 1800s, shaping the way homes were designed and built. Sped by publishing and through builder’s guilds, knowledge of the Greek revival style spread and came to dominate the smaller towns and rural areas. Local craftsmen, using Greek decorative details, created an extraordinary variety of unique folk structures. Some of the most elegant works produced in the Greek Revival style were based on archeological discoveries, particularly the public buildings and in the prosperous class. 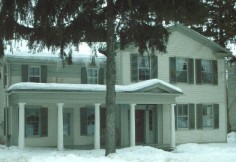 Identify the style by its entryway columns, and its full-height or full-building width porches. Throughout history columns have held a special significance. Originally reserved for temples, columns give a building an appearance of great importance. 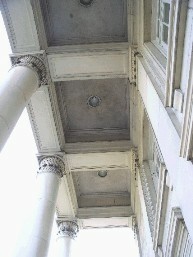 Columns were no longer reserved for the wealthy or for important public buildings as in the Federalist style. Many small homes were built with columnar entrances. White wood frame houses of this style are seen everywhere. Regional materials such as granite, sandstone and marble were used to create smooth surfaces and then trimmed with wood Greek motif ornaments. 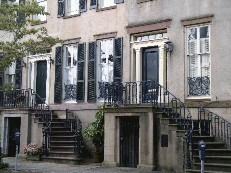 Cast iron decorated porches and stair railings. Windows are treated with bold lintels or heavy molding and multi-paned (typically six over six) as in the Federal period. The entry doors are flanked by sidelights trimmed with wood ornaments of leaf-like or geometrical design. If a transom is used it would be rectangular. In the 1850's, Greek inspired designs gave way to those based on Gothic and Italian precedents. By 1860, the Greek Revival era had ended.